As an experienced NJ attorney, clients often ask me why having a will is important. While the courts do not force you to have a will, it is usually a good idea to plan for end of life decisions in advance. Without a will, the laws of the state of New Jersey determine how your estate will be divided among beneficiaries. First, if you die without a will, you will die intestate. This is the technical term for having no will upon your death. There are certain intestacy laws in NJ that set a particular schedule of how the state will divide your estate. To begin, the state usually distributes your estate to your spouse first and then to your children if you are married or have children. Next, if you’re not married, the state leaves your estate to close family members such as, your parents and your siblings. In addition, if there are no surviving close family members, the state considers increasingly distant family members in which to leave your estate. Finally, if the court exhausts this list to find that you have no living relatives by blood or marriage, the state will take your property. Often times people do not want to have their estate and assets distributed by the state. 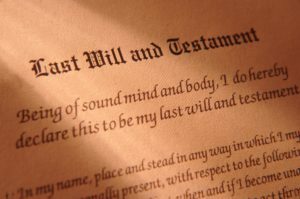 The only way to maintain control of your assets after your death is through a will. I believe that most people do not want the government distributing their estate and that is why you should consider having a will. It is important to think about how you would like your assets to be divided and memorialize in a legally recognized manner. Many clients find it reassuring to know that their requests will be honored after their passing. to name an executor, the person who makes sure that the terms of your will are carried out. Are you concerned that your assets may not make it to the right hands after you pass away? Have you recently gotten married or added children to your family? If so, it may be time to consider creating or revising your will. Contact our experienced attorneys at the Law Office of Sara McArdle at 973-366-5244 to schedule a consultation. This informational blog post was brought to you by Kevin McArdle, an experienced Estate Planning Lawyer.